Welcome Guys..!! Today we’re going to show you with the help of a Video that How you can Backup your App Data without even rooting your Android device. This could really help you to backup your Android Games data which if deleted, you must start from beginning. Also you can transfer the game (app) data from one device to another and restore it, and start playing games where you left. One important thing to note is that right now, it is one of the few apps which supports backups on Android 5.0 even with SELinux set to enforcing. Backup+ is an app manipulation program that allows you to do a complete backup. Currentlu, it is in very early stages of it’s development and is for now to be considered an alpha. Please note : Backup+ works properly with SuperSu at the moment. BUSYBOX is REQUIRED for data Backups and Restores. Backup+ can backup only apps for non-rooted devices (without data). 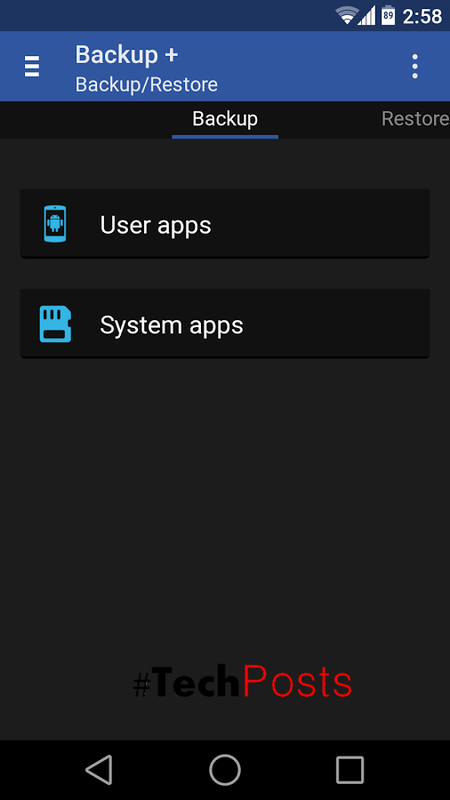 For app data and system apps root is required. Bugs are to be expected and as an early adapter you are requested to report crashes and force-closes using the built-in bug reporter which appears when the app crashes. You can also mail Developer with your feature requests, suggestions and ideas. Right now it only has the basic app backup and restore functionality, but expect this app to mature with time. Backup+ Pro version, this app will have multiple in-app purchases for each premium feature, and not just a single pro key. This will allow you to buy just the features you need and avoid paying for the features you don’t want. The total worth of all the in-app purchases will still be less than/equal to the pro keys of other backup solutions. For now, the only premium feature is “SYSTEM APPS”, which allows you to backup and manipulate system apps, future items will be cloud backup and so on. Just wanted to let you know that We’ve launched YouTube Channel where we upload awesome video content. Make sure you hit the subscribe button to stay up to date with the new videos we upload every week. Also Subscribe us for more How To Guides and Reviews…!!! @http://youtube.com/checknma for more How to Guides. Enjoy..!! !